Home news TWO NIGERIANS HAVE BEEN KILLED IN FRESH XENPHOPHIC ATTACKS IN SOUTH AFRICA. 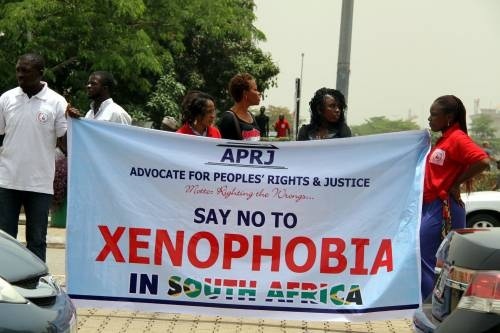 TWO NIGERIANS HAVE BEEN KILLED IN FRESH XENPHOPHIC ATTACKS IN SOUTH AFRICA. "He said, " We gathered that his assailants followed him from 152 Hay Street Turffontein, and thereafter, stabbed and killed him in front of his gate at Turf Road, Turffontein." It was gathered that the latest victims were stabbed to death during a renewed wave of xenophobic attacks that swept through Johannesburg and Cape Town on April 5 and April 6 2019, respectively. Mr Odefa Ikele, the Assistant Public Relations Officer, Nigeria Union in South Africa(NUSA), confirmed the sad news to journalists on Monday. "The Nigeria community lost two citizens to gruesome murders over the weekend," he said. "Mr Bonny Iwuoha, 48, from Ihitte/Uboma in Imo State, was stabbed to death at about 11:45pm on April 6, 2019 in Johnnesburg, South Africa. "We gathered that his assailants followed him from 152 Hay Street Turffontein, and thereafter stabbed and killed him in front of his gate at Turf Road, Turffontein. The killing was witnessed by Mr Izochukwu Nwokocha, also known as, Nwa Father." Ikele said the killing had been reported and a case of murder opened at the Booysens Police Station in Johnnesburg. He said another Nigerian, Goziem Akpenyi, had been killed in a similar circumstance a day earlier. "Akpeyi was allegedly stabbed to death by three unknown colored South African men after an argument with the deceased," he said. "The incident took place at Cape Town at about 1pm on Friday, April 5, 2019. These latest killings add to four other Nigerians who were shot dead in March. Three of the victims were murdered in Sunnyside, Pretoria, and one in Balfour park, Johannesburg." Ikele expressed the concerns of NUSA over the incessant killing of Nigerians and worried that the perpetrators had not been brought to book. According to him, the arrest and prosecution of the cususpects by the South African Police would put a stop to the daily killings of Nigerians. "We call on the Nigerian Government to impress on their South African counterpart that the killings have to be investigated and the culprits prosecuted," he added.